Kassim the Dream comes to SFFF as part of the American Film Institute Project 20/20. A documentary, the film tells the story of Kassim "The Dream" Ouma, his past as a child-soldier in Uganda, his success story as a professional boxer in the United States, and his trip back to Africa. You can imagine the clichés a story like this could throw up and the sensationalist and exploitive tack a filmmaker could take, but I can assure you, you can't imagine the graceful balance of humor and sincere emotion with which filmmaker Kief Davidson succeeds in this project. The film is well made. It knows when to pause and it knows when to party. It stays really funny, really serious, really adorable, and really sad without ever crossing into excess, an accomplishment that evidences the hard work and smart decision-making behind this film. Shifting from eloquent footage symbolic of Kassim's past, to professional boxing matches, to Kassim and his family, to interviews with boxing experts and Kassim's closest friends, to Kassim's return to Uganda, Davidson's work manages a number of different aesthetic and emotional demands quite seamlessly and maintains the spirit of the film. This spirit, as Davidson himself acknowledged in a post-screening Q&A, is Kassim's. And really, this is where the heart of the film lovingly rests. Kassim is magnetic. Through much of the film, he smiles a smile that made me sure I was right there with him laughing at his kids' Cuteness (that's a capital 'C') and sharing in his joy. 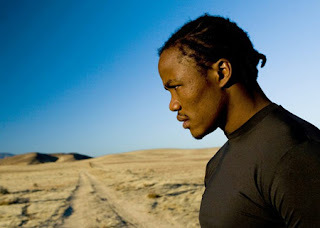 He's a professional boxer and an ex-child-soldier, two worlds that--in obviously quite different ways--breed violence and one-track minds, yet Kassim persists in his complicated existence: he tears up at a devastating loss in the ring; he winces and squirms as his hair is tugged and braided; he believes in the choices he has made; he opens himself up to the emotional reality of his past and present with a courage and commitment I can't begin to describe here. Above all, this is one of the most viscerally and joyfully engaging movies I've seen in a while. Kassim's love for life is too beautiful and the tragedy beneath everything is too overwhelming for this film not to make an impact. There was a moment in this film, after Kassim has faced head-on the terror of his past and the Uganda he left behind, where Kassim gives a glance and a strained sigh that showed me grief complete and brought me very near a feared edge. I imagine anyone could find a moment of that magnitude in this film.